I’m glad I went to Auschwitz. I’m still processing what I saw, what I heard. Most of you will know the histories of the dreadful death camps. The weather was appalling today. Double speed windscreen wipers on the way there. I was cold and wet. But I was well-clothed and shod, I’d had a good breakfast, and soon I’d be warm and dry. The inmates of Auschwitz and Auschwitz-Birkenau had their one and only pair of never-washed louse-infested pyjamas and next to no food inside them. They wouldn’t be going somewhere cosy for a change of clothes and a nice hot drink in a couple of hours. I’ll just share two vignettes. Imagine a long narrow room, with a display case on each side running the length of the room. Each is filled with human hair. This hair comes from the heads of women and girls exterminated in the gas chambers of Auschwitz. A very small proportion of the total. This is the hair of some 80,000 women. In the next, similar room are shoes. Thousands of shoes. They belonged to some of the thousands of murdered Jews. I took no photos in Auschwitz. It seemed disrespectful to take snapshots of those glimpses of real lives, real tragedies. 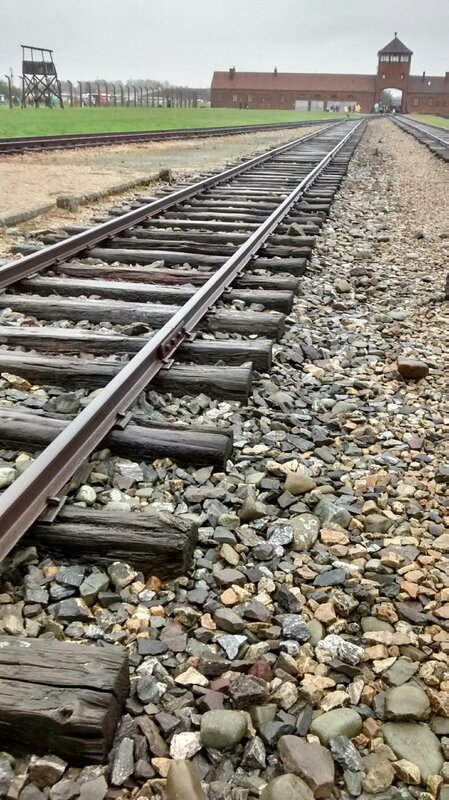 I’ll just include one familiar image of Auschwitz-Birkenau, with the train lines which transported people to their almost certain deaths. I’m glad to have gone because I left with a certain feeling of optimism. The custodians of these camps and the guides who bring those dreadful days back to life are passionate about sharing the stories, to try to make sure, against the odds, that they are never repeated. Our young guide told us he had been trained by an Auschwitz survivor. He clearly saw his job as no ordinary responsibility. Today, and every single day, thousands of visitors take these lessons away with them. My visit there does deserve a more considered post. Just – not yet. I’ve been thinking about you today. Very touching that the young guide was ‘trained’ by a survivor. Can’t help wondering what the training entailed. I visited Auschwitz this year also. And like you I found out that it is somehow disrespectful to take pictures in face of so much sadness. The pictures never really portray what a person feels beeing in there and imagining oneself in the place of those who died. Thank you for posting. It might be on the tourist route, but it’s very far from being touristy. A necessary journey perhaps. I think so. I am convinced that every person should see it when old enough to understand, so that we can learn from history and not repeat it. My ex husband was from a polish Jewish family who came to Britain in the thirties. They came to escape the horrors. I never knew that. How interesting. I certainly had an experience which will stay with me always. Let the world never forget! I was too cowardly to visit Auschwitz when in Krakow. Not cowardly at all. In some ways though it was a positive experience seeing the effort made to ensure a permanent and respectful memorial. Well done for finding the strength to see for yourself. Thank you for sharing your thoughts and memories of the visit, I imagine they will never leave you. No. I’ll never forget it and I’m glad I went. We visited the Anne Frank House whilst in Amsterdam last week. It was hard to know quite how to feel there, because in some ways hers is an inspiring story of survival: the two years they managed to live successfully in hiding in the Secret Annex, and the fact that her diary survived and has been so influential. But then, of course, it turned into a story of betrayal and separation and certain death. Her father Otto survived Auschwitz, but he was the only one. After my visit I realised what an extraordinary thing it was to survive this brutal regime. And also that perhaps death would have been preferable. I’ve been wondering how you got on. I’m glad you came away with a feeling of optimism. Now you’re a part of that ripple effect that happens when awareness meets with fertile recipients. It’s hard to feel all that optimistic these days though. I understand. The news of the present seems like a foreshadowing of the past. That’s why optimism is so important – if we can’t see and believe in something better, it’s harder to find it. Thank-you very much for your thoughts and impressions here, Margaret. It was quite hard to know what to write. I can understand the difficulty in writing about these places. A visit to Buchenwald over 25 years ago has not been forgotten not least my shock at its proximity to Weimar less than seven miles away. After the overnight election results and the shocking news that the AfD now has seats, more than ever the lessons of history are needed. Optimism and hope is in short supply indeed. Indeed. And I can imagine that, like you, I shan’t forget my visit. It’s impossible to know how we’d have reacted to this hell. Your friend sounds remarkable. I doubt if I’d have been very brave or resilient. I agree completely. I doubt I would have survived although interestingly she said women did better than men. You’ve been on my mind – the Holocaust is unthinkable. How could humans perpetrate such a crime against humanity? We have a Holocaust Museum in our area – it’s small but it serves the purpose of remembering the past so the past does not repeat itself. In my visits to our museum I’ve learned that of the 6 million Jewish people who were murdered in the Holocaust, over 3 million were from Poland. Visiting Auschwitz is on my list of things I want to do in my lifetime. I hope you are able to see the beauty of Poland after seeing the worst. Enjoy your trip and teh days you have remaining enjoying Poland. Peace. Thank you. It’s been fascinating. But not a holiday. You were brave to go and brave to write about it–what to say, really?? How does one do justice to such horror in mere words? I’m encouraged by the tack you took–looking for the positive and optimistic in such a forlorn place . . .
It’s strange how I did feel positive as I came away. As we left, we passed the crowds waiting to go in, chatting among themselves. We were all totally silent, reflecting on what we’d seen. ‘Liking’ this post doesn’t feel appropriate but I’m glad to have read it. Thank you. Margaret, you have captured the solemnity and magnitude of your visit and I thank you for it. I can’t know if I would have made this visit had I the opportunity. I’d like to think that I would, but who can tell until the chance is presented? You have given me cause to reflect. It’s been a week since my visit, but I know it will always be fresh in my mind, and I’m glad I went. Next Next post: Very flat, Poland.